The Best Fibromyalgia blogs from thousands of top Fibromyalgia blogs in our index using search and social metrics. Data will be refreshed once a week. Also check out Fibromyalgia Youtube Channels. 2.29 I tripped over a Stone | My life with Fibromyalgia. 2.40 Fibro, Fit and Fab! 2.42 Fibro Fantastic | "To Thrive Not Just Survive"
Fibromyalgia newsletter is a comprehensive summary of the day's most important blog posts and news articles from the best Fibromyalgia websites on the web, and delivered to your email inbox each morning. To subscribe, simply provide us with your email address. About Blog Fibromyalgia News Today is dedicated to providing comprehensive coverage of news related to Fibromyalgia. Fibromyalgia News Today is a science and health publishing website that occasionally writes about clinical trials taking place in the Fibromyalgia research community. Facebook fans 3,452. Twitter followers 389. About Blog A Directory Of People Who Blog About Fibromyalgia. Welcome to the movement to connect fibro bloggers, inspired by all the fibro bloggers and their stories. Facebook fans 2,842. Twitter followers 8,883. Orange County, CA About Blog Fibromyalgia blog for those with chronic illness. Facebook fans n/a. Twitter followers 43,487. About Blog FedUpwithFatigue.com brings you the latest news, research and useful tips to help you live better with fibromyalgia and/or Lyme. Follow me as I share tips to live better. Facebook fans 8,938. Twitter followers 4. San Francisco, CA About Blog A community of users to discuss and share information about Fibromyalgia . Facebook fans 1,149,426. Twitter followers 510,492. IL About Blog Hi, I'm Sue. I've been diagnosed with fibromyalgia, migraines, mutiple chemical senstivities, depression, and asthma. The purpose of my blog is to let you know you are not alone and there is hope for living with chronic illnesses. Facebook fans 2,135. Twitter followers 1,431. North America About Blog Fibromyalgia Forums is an all-volunteer support group for sufferers of Fibromyalgia and Chronic fatigue syndrome that is provided free of charge to anyone affected by Fibromyalgia or CFS. FibromyalgiaForums is the only fully moderated, absolutely free, hassle-free online support group and CFS chat group dedicated solely to individuals suffering chronic pain. Facebook fans 5,953. Twitter followers 2,066. About Blog I am a follower of Christ, wife to a supportive husband, mother to four sweet children, and fibromyalgia thriver. Being Fibro Mom was created in 2013 in the hopes of sharing tips on thriving the family life with fibromyalgia. My mission is to advocate parents while enduring the hardships of fibromyalgia. Facebook fans 2,509. Twitter followers 783. Portland, OR About Blog Ginevra Liptan, M.D. is a graduate of Tufts University School of Medicine, board-certified in internal medicine, and trained in functional medicine, a holistic approach that blends both western and alternative medicine. Facebook fans 4,454. Twitter followers 499. Birmingham, AL About Blog Dr. Rodger Murphree is the founder and past clinic director for a large integrated medical practice located in Birmingham, Alabama. He is a graduate of the University of Alabama Birmingham (UAB) and is a board certified chiropractic physician. Facebook fans 73,850. Twitter followers 443. Portland, Oregon About Blog I am a Certified Health Coach who has fibromyalgia. I provide specialized coaching and resources to help women just like you. Women who have fibromyalgia and want to break free from the prison their bodies have become, restore their strength and health, and finally live the lives they've been dreaming of. Facebook fans 4,012. Twitter followers 959. About Blog Our mission is to spread awareness of Fibromyalgia for patients diagnosed with this debilitating condition. Facebook fans 1,162. Twitter followers 117. About Blog We created this page to share the ups and downs of life with fibromyalgia, chronic pain and CFS/ME. This is a great spot to learn about research news, get inspirational quotes, maybe even a recipe or two and our favourite tried, tested and true products that make a difference in everyday living. Facebook fans 12,109. Twitter followers 2,015. Newcastle Upon Tyne, England About Blog Adam is a Newcastle based specialist Body worker who, over the past 6 years, has developed pain management programmes for those suffering with Fibromyalgia, Ehlers-Danlos syndrome, ME/CFS. Facebook fans 16,953. Twitter followers 104,468. Facebook fans 3,269. Twitter followers 465. About Blog Hi, Iam Barbara Keddy. I have lived with fibromyalgia for about 40 years. But I no longer believe that fibromyalgia is totally hopeless and I am currently working on a program that is helping me understand the nature of my pain and how best to increase my mobility and turn my life around. It is an on-going journey, a work in progress. Duncan British Columbia About Blog My life changed dramatically about a year ago when I was diagnosed with Fibromyalgia. I have been trying ever since to learn how to LIVE life with chronic pain & a brain that constantly fails me. Facebook fans 1,113. Twitter followers 1,135. San Jose, CA About Blog I created this blog to share my experience with fibromyalgia, depression and various other fun things I have been diagnosed with over the years… my ups, my downs, my doctor visits, what i learn and what i recommend. Facebook fans n/a. Twitter followers 1,880. Manchester About Blog Brian Barr specialise in assisting claimants throughout England and Wales with personal injury and insurance claims. Fibromyalgia is a condition we specialise in and, on our blog, you will find information on the syndrome and advice on how you can better cope. Facebook fans 1,028. Twitter followers 887. About Blog My name is Suzanne, Working wife, mom and student struggling with Fibromyalgia. In my blog posts you will find comfort in that you are not alone in the challenges of marriage, raising kids, working full-time, and working towards big goals (like going back to school as an adult). I think whether you have a chronic illness or not, you will be able to relate and find encouragement in my blog posts. About Blog Because There is More To Me Than Just Rheumatoid Arthritis & Fibromyalgia. My blog is about who I am and how I have grown, preserved, and endured since being diagnosed. I was diagnosed with rheumatoid arthritis (RA) and fibromyalgia (FM) nearly five years ago after many years of dealing with symptoms that no doctor could explain. 29. I tripped over a Stone | My life with Fibromyalgia. England, United Kingdom About Blog On a one woman mission to educate the world on chronic and invisible illnesses and disabilities. Here to support who ever needs it! Facebook fans 189. Twitter followers 23. About Blog Fibro Warriors ~ Living Life strives in helping others understand what it means to live life with Fibromyalgia. Facebook fans 20,263. Twitter followers n/a. Los Angeles, CA About Blog Disabled at the age of twenty-eight by the mysterious illnesses chronic fatigue syndrome and fibromyalgia, five years later I survived two life-threatening strokes. Clinging to life and determined to change my trajectory, I embarked upon a journey to reclaim my lost health. Never easy but always worth it, I write to share the reality of both embracing and overcoming a life most unexpected. Facebook fans 11,776. Twitter followers 421. Australia About Blog I am not a doctor or any other kind of expert in Fibromyalgia (FM)– I am just a fellow sufferer who is sharing what I am doing to combat this awful condition. Facebook fans 11,569. Twitter followers 1,501. About Blog If you are facing Fibromyalgia you will find lots of information here to help you understand the science behind it, the treatments available, including alternative treatments,coping strategies and my personal journey with it. Facebook fans 1,705. Twitter followers 8,883. San Diego, CA About Blog FibroAid is a multivitamin looking to help with common deficiencies seen throughout people with Fibromyalgia. Facebook fans 4,100. Twitter followers 18. Texas, USA About Blog Fibro and Fabulous is a blog about my life, my Fibromyalgia, and my feeling fabulous despite my condition. Come feel fabulous with me! Facebook fans 308. Twitter followers 1,951. About Blog A Fibromyalgia Blog by Jenny Ryan. In this blog you will find my journey with an attempt to educate and inspire others who are dealing with similar health issues. Facebook fans 1,346. Twitter followers 252. 40. Fibro, Fit and Fab! USA About Blog I am a wife, mother of 3, born-again believer, blogger and "Fibrowolf" who has a passion for natural food and helping those with the top 8 allergens and/or Fibromyalgia. This is a blog about my journey to becoming fit and fabulous despite having Fibromyalgia. Facebook fans 350. Twitter followers 730. Plymouth, England About Blog My name is Em, I’m 42 years old. I’m a wife and mother and yes I live with chronic illness; two, plus a little arthritis, to be exact. Nearly 5 years ago, weight training entered my life and changed it in ways I didn’t think was possible. Fibromystory is a personal blog of my experience of living with Fibromyalgia and Hyper Mobility Syndrome. More importantly, how managing them with a combination of weight lifting and nutrition has put me back in control of my life. Facebook fans 61. Twitter followers 278. 42. Fibro Fantastic | "To Thrive Not Just Survive"
England, United Kingdom About Blog A Healthy Living Blogger, Wellness Coach & Fibromyalgia Warrior for just over 27 years, inspiring and empowering fellow sufferers to be fibrofantastic. Fibro Blog brings all latest news and health updates on Fibromyalgia. Sharing personal experience of wellness through the power of social media. Facebook fans 344. Twitter followers 355. About Blog Hi, I'm Bethan! I'm 24 years old and have fibromyalgia. I started this blog to come to terms with my diagnosis but also to raise awareness and help others with similar conditions know they are not alone. Facebook fans 69. Twitter followers 272. Newry, Co.Down About Blog Hope 4 ME Fibro is a non-profit registered charity based in N.Ireland. Solely run by volunteer patients to support others suffering from M.E. and Fibromyalgia. Facebook fans 912. Twitter followers 269. Novi, Michigan About Blog A Fibromyalgia Blog by Dr Sharon. Montevallo, Alabama About Blog A look into a life with fibromyalgia, chronic pain, and other invisible illnesses. I hope to help others in their every day struggles with chronic pain. Perhaps I can make you laugh or share with you something to think about. I am still learning about this thing called Fibromyalgia but I do have chronic migraines and a few other goodies. About Blog Hi I’m Hannah and I thought I would use this page to briefly introduce myself. I’m 25 years old, a qualified teacher, wife and fibromyalgia sufferer. Over the last 25 years I have had many ups and downs, had a lot of health problems and gone through some life changing events. But as always I have come out stronger. About Blog I was diagnosed in 2010 with Fibromyalgia and Chronic Fatigue along with a long list of other things. In the beginning I thought I would blog about issues to keep track of my problems but there are days I just don't feel well enough to blog or read blogs. Who knows maybe someone will stumble across some of the posts and it might help them or they might have some suggestions that could help me. About Blog I am a Fibromyalgia Peer, surviving Well for 16 years. My blog is a place where I share my own experience and links to websites with other fibro peers. I blog about fibromyalgia in these, and other areas; empathy, pain concerns, education, self advocacy, self care, information, perspectives on treatment and living Well, research, news, tools, and more. 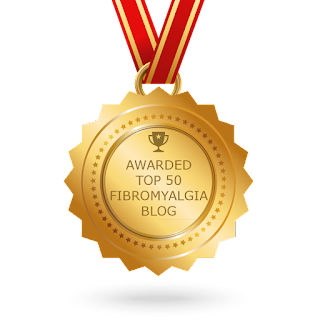 CONGRATULATIONS to every blogger that has made this Top Fibromyalgia Blogs list! This is the most comprehensive list of best Fibromyalgia blogs on the internet and I’m honoured to have you as part of this! I personally give you a high-five and want to thank you for your contribution to this world.